Second hand furniture shops in Essex offer some of the most unique and exciting pieces for your home. While the continued trend towards mid-century modern design encourages manufacturers to copy these iconic designs, shopping around for second hand items can get you the genuine article. Moreover, not only do authentic 20th-century pieces embody the classic design of their period, they can offer very high-quality construction and composition. However, buying second hand has its pitfalls. As experts in sourcing and selling 20th-century furniture, we wanted to share our top tips for buying second hand. While second hand furniture can offer unique and good quality options, it can also be a gamble. Essex second hand furniture shops may not offer return policies or warranties on their pieces. Worse still, second hand furniture may harbour pests that you don’t want in your home. However, on balance buying second hand is a great option for people looking for furniture with timeless style. By observing a few golden rules, your second hand furniture shopping can be a success. Scrolling through Craigslist, browsing car boot sales, attending auctions or visiting second hand furniture shops in Essex can be overwhelming. There are so many interesting things! So many intriguing and one-of-a-kind finds! However, the key to successful second hand shopping is starting with a clear idea of what you need. From here you can do a little homework on how to tell a quality piece from an inferior one. Different kinds of furniture displays different kinds of marks of quality. The more you know about buying quality furniture, the better you can assess second hand pieces. Similarly, when you know what you are looking for, you can learn how to choose a quality item of that type. To test frame strength, lift one front corner or leg of the sofa off the floor. By the time you’ve raised it six inches, the other front leg should have risen too. If it’s still touching the floor, the frame has too much give; it’s weak. Classically beautiful and hard-wearing, leather is a great furnishing material. Keep in mind a few simple tips to choose good quality leather furniture. For example, you can distinguish genuine leather by smell and texture. If it feels soft and warm with a rich aroma, it is likely genuine leather. Likewise, examine the grain. As a natural product, genuine leather shows variation, and a very uniform grain suggests a fake. A good stain enhances the natural beauty of wood and adds color and character… High-quality staining will be even without any dark spots. All sides and the ends should be the same tone. 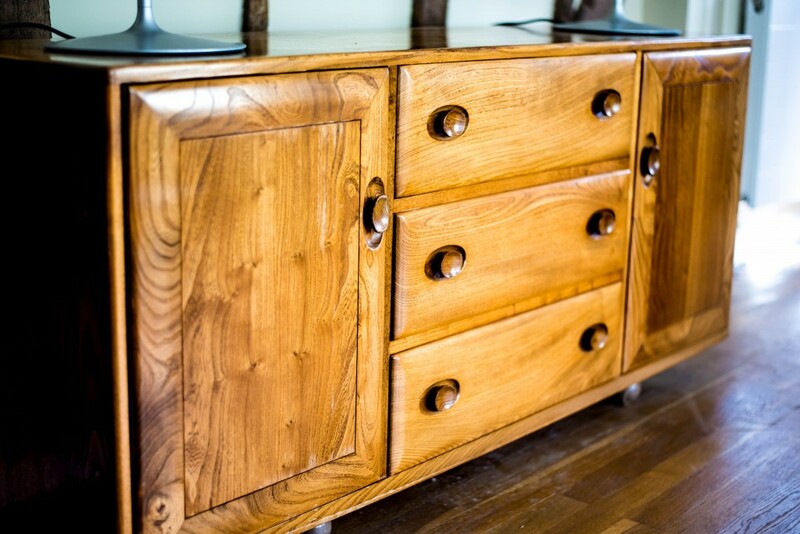 Typically, quality wooden furniture is crafted from hardwoods such as oak, maple, teak, walnut and cherry. Additionally, the wood should have been air- or kiln-dried. The days of solid-wood furniture are largely behind us. However, antique finds may offer this. Also, a well cared for veneer can offer many of the advantages of solid wood at a more reasonable cost. Joinery is a clear sign of quality wooden furniture. Mortise and tenon, dovetails and the use of corner blocks are tried and true elements of quality construction. Any drawers should fit properly and move well on their glides. Similarly, doors or drawers should close flush to the piece and operate with sturdy hardware. Lastly, the finish of the wood can tell you about the piece’s quality. Wood finishing involves sanding, staining and sealing. Sanding should be done with the grain from coarser to finer grits, resulting in a smooth surface. Roughness suggests poor sanding. Stain should be applied evenly across the piece to enhance the beauty of its grain and even out natural discolourations. Finally, the sealant should be smooth and free of bubbles or dust. Expect the back and underside of a piece to be finished to reduce swelling and shrinking. So you’ve been combing through second hand furniture shops in Essex and beyond for that special piece. At last – you’ve found it! You examine it carefully for signs of quality and comfort. This includes opening and closing doors and drawers. Also, lifting and pushing to test its frame. While you’re at it, have a seat, bounce just bit and look under the cushions. All seems to be order. You are ready to purchase. Wait! There’s one more step, check for pests. Many people are – rightly – suspicious of the hygiene of used mattresses. However, any upholstered furniture can play host to nasty creepy crawlies you want to keep out of your home. Therefore, look very closely at the seams, joints and backs of a piece. Dark stains or insect egg casings in these areas could indicate a problem. Indeed, take the time to learn how to identify carpet bugs, bed bugs and fleas. Armed with our top tips, you’re ready to start shopping! Happily, our region hosts a number of fine second hand shops. For example, those interested in mid-century and Danish design should consider Pelikan Online. Owned and operated by Penny and Rachel, the company imports original Danish sofas and expertly restores them. In this way, the authentic mid-century aesthetic is retained, and the piece’s longevity is extended. Looking for the finest second hand furniture in Essex? A showroom packed with rare and wonderful finds? MRS FOX furniture shop in Essex is the place for you. We source the finest mid-century and Art Deco furniture. Viewing exclusively by appointment.